The eldest daughter of Baron t'Tremaine, married at the age of almost eighteen to the l'Valdan prince Silvio and hence unable to follow through with her path towards knighthood; mother to Lord Etienne; sister to Lord Sir Elrick t'Tremaine; a princess whose grudge against people of the South is usually hidden beneath a veil of courtesy. Antonia l’Valdan was born in the year 1837 at Hartswood. Even if she is the eldest child of Baron Benjamin t’Tremaine and his wife Annaliese, Antonia is not the heir, this position going to her brother Elrick t’Tremaine. Even so, she was sent to Northwatch Hall in Murnord at the age of 11, to serve House l’Corren, first as a page, then as a squire; by early 1851 she witnessed the beginning of the last battle occurring in the Thirty Years War- after its official end, actually. A natural distrust towards people of Rivana was nurtured, and her wish to become a knight strengthened. She was already far into her training, when it was decided that she should become a match for the younger Prince Silvio l’Valdan, a one time opportunity for House t’Tremaine to become more attached to the royal House of Couviere. Prince Silvio was a fleeting acquaintance, yet it was not his personality that put her off, more the fact that she had to discard her chosen path to become a knight, which may explain the lack of deeply felt enthusiasm with which Antonia entered into the state of marriage. A few months after the wedding she was blessed with pregnancy, and Antonia kept mostly to the Palace at Rovilon. Their son, Lord Etienne, was born in the year 1856, a healthy boy. The childbirth did not come without some complications, but even so, mother and son survived and were well enough in the end. The care for Etienne took most of her time afterwards, given it was her duty to see to her son’s well-being. Only very little time was left to her to pursue her favored practice with the sword in those first years, still this was an occupation she soon resumed when Etienne grew older, whenever time allowed, to keep in shape and in the state to defend herself. Regular sword practice would be as far as it would get, in regards to her martial pursuits, at least for many years. While her husband Prince Silvio, a knight, would soon travel to the North with his brother the Crown Prince, to battle Tirian forces in both Sieges of Valetta, Antonia would stay behind, to take care of Lord Etienne, who until this day, has remained the only child of the couple. It was during the most recent invasion of the Tirians, in Mai 1866, that most of the troops and the l'Valdan Princes and Princesses were away to battle the enemy in the North, when Rovilon was attacked by Brodlund raiders. It was on King Maris and Sir Michael l’Corren to lead the remaining forces against the enemy, and Antonia for once was allowed to fight the immediate threat to the Capital. An opportunity she readily accepted and seized, slaying a good number of Brodlundians, keeping to the King’s side until he engaged in a one-on-one fight against their leader - a fight the Brodlund man lost in the end - making King Maris the victor. But the King was dying. Together with Sir Michael, Antonia saw to it that her father-in-law was brought to the Cathedral, according to his wishes. Feeling his life fade already, King Maris asked her to help him pen two letters, one to his wife, Queen Cynthia, the other to his eldest son, the heir. Together with Sir Michael l’Corren she stayed at the king’s side, until his last breath left him. Standing tall at 5'7", of a slender but toned physique from regular sword practice in the yard, this woman moves with the effortless controlled grace of someone used to both courtly dances and regular sparring sessions; her features comely, dominated by a pair of grey eyes, above a straight shapely nose and a less dominating pair of lips; her brows a darker pair of even, almost regal curves; her long dark blonde hair mostly worn with the better part of it falling openly about her shoulders, while two strands starting at the temples have been braided and joined at the back of her head. Personality: Antonia l’Valdan is outwardly polite, keeping her countenance as would be expected of one of her station at courtly occasions; among her friends and family she is less ceremonial, prone to laughter and anger as anyone else; her main focus is her son, Lord Etienne, whom she spends much time with, taking care he receives a good education, as well as good training with the sword, which she sees to personally at the moment. Her husband is another anchor, she has grown fond of him over the years. She distrusts any people of the South, this due to a grudge her former House of t’Tremaine holds against Rivana since the Thirty Years War. Another of those hidden rifts in her soul is the fact that her betrothal came with the strong suggestion that she should discard her training to become a knight. Swordplay is still a favorite pastime, and one she aches to put to good use. Born in the Saddle: Given the time she spent in service of House l’Corren as page and then as squire, much emphasis was put on improving Antonia’s riding abilities. Skilled One Hand Blades: The sword was soon her weapon of choice, while she never really got into the use of polearms. While still a squire she has proven quite persistent in pursuing her training, and even after her child was born she now often spends time with sword practice in the yard; it is a skill she seeks to improve to perfection - and which she has already started to instruct her son in. Good Reputation: Antonia is married to the well-liked and popular Prince Silvio l’Valdan, but even so, she has never been the cause for ill rumors or any scandal. Also the fact that she took up her sword to fight beside King Maris in his last battle, when Brodlund attacked Rovilon just recently, and afterwards stayed with him when he died - this speaks as well in her favor. Grudge: Being a t’Tremaine by birth means you usually distrust any people of the Kingdom of Rivana. It is a character trait deeply rooted within Antonia, as it is what she has learned from her parents, ever since she could walk. Because House t’Tremaine suffered grievous losses during the Thirty Years War, and places a large part of the blame for their decline in power on Rivana, and especially House Haldis. So while Antonia will try to maintain a somewhat courteous facade towards guests of Rivana, as is her duty, she may not always succeed. The marriage of her sister-in-law Princess Ariane to a Greycen, which she attended, ironically enough, is not something she personally approves of. Ambitious: This is a quirk Antonia has inherited from her birth House t’Tremaine - the will to get back to one’s feet, to prove something, to rise again. Her marriage to a prince was one step needed for her House to gain ground. Now that she is married, this ambition has moved into other directions. One of them being to be acknowledged for her skill with the sword. Another to further the interests of her beloved son, Lord Etienne, as she is already considering various skilled and famous knights, one of whom he may squire for when his time comes. Loyal: She is completely loyal to the King of Couviere, and would never work against him. Tight-Knit: In the eleven years of being married to Prince Silvio, Antonia has grown into this family, being accepted into it despite the rather impoverished insignificance of her former House. The birth of her son, an ever-growing fondness of her husband, and last but not least, the fact that she could fight at King Maris’s side in defense of Rovilon against the Brodlund Raiders; that she was with him when he passed away; all of these things have tied her strongly to House l’Valdan, in a deep emotional bond. Othello: White courser, current tourney horse. Fabio: Dapple grey courser, she rode during Sunsreach tourney. 1848, Aout: Antonia is sent to Northwatch Hall in Murnord, to serve the liege House l’Corren; she starts off as a page, and becomes a squire to a l’Corren knight in Novembre 1850. 1851, Fevrier 7th: The young Crown Prince Jean-Paul l’Valdan routs a large Rivanan force attempting to batter its’ way into Couviere. Both sides are unaware that the war is already over. A very young squire Antonia t’Tremaine is there, following her knight on her own accord, disobeying his orders to stay behind at a nearby village they had passed; when her knight spots her, displeased with her being there, he sends her off right away with a sound rebuke, shortly before the battle begins; even so she witnesses some of the battle from the fringes of a forest bordering on the battlefield, before she obeys and rides off. Taking impressions with her that strengthen her goal to become a valiant knight, to serve Couviere’s cause; but also strengthen her dislike for the people of Rivana. 1854, Octobre 30th: The betrothal to Prince Silvio is officially announced, and Antonia’s leave of her knightly training arranged with House l’Corren; her new impending duties do not allow her to continue her pursuit of knighthood. 1855, Avril 23rd: Lady Antonia t’Tremaine is married to Prince Silvio l’Valdan at Rovilon. 1856, Marse 17th: Antonia gives birth to Lord Etienne l’Valdan, a healthy boy. 1862, Janvier: Silvio leaves with his brother, Crown Prince Jean-Paul, and a large force to break the First Siege of Valetta, and drive out the Tirian forces from Couvieri lands. Antonia’s wish to accompany them is declined, by both King Maris and Queen Cynthia. There is a young Prince that needs to be taken care of. 1865, Octobre: Antonia and Silvio attend the wedding of her sister in law, Princess Ariane l’Valdan to Lord Thaddeus Greycen in Pacitta, where King Maris l’Valdan gets poisoned. 1866, Fevrier: The forces loyal to the Queen rally and assault the Capital Rovilon to free it from the Cardinal’s Guard. The arrival of Prince Jean-Paul sets the people against the guard and battle quickly becomes one to secure the palace. When the Queen, Prince Silvio, and the Princesses Emmaline and Aliza attempt to flee, Antonia and Etienne are with them, but their attempt is thwarted, they are apprehended by the Cardinal's Guard. Only when King Maris arrives and wounds the Cardinal they are freed, as the Cardinal’s escape turns the tide in Couviere’s favor. 1866, Marse: Silvio is once again away, accompanying his brother Crown Prince Jean-Paul with forces heading for Valetta to fight the Tirian forces, to take part in the Battle of the Breach and the Battle of Three Crowns two months later; Antonia stays behind, tasked with looking after their son Etienne. 1866, Mai 15th: Rovilon is attacked by Brodlund raiders, and Antonia is allowed for once to assist in fending off the immediate threat of the enemy, fighting beside King Maris; the fight is swiftly ended when the King slays their leader Ivar Thronson, Antonia killing some of the raiders until the few Rovilon forces drive them off. It is a meaningful event in Antonia’s life, as she can prove her worth for the kingdom in a more martial manner, for once putting her extensive sword training to good use. The day is marred by the fact that her father-in-law is severely injured and soon succumbs to his wounds, she staying beside him at the Cathedral, where she assists him in penning those last letters to his wife and Prince Jean-Paul, until he dies a peaceful death, with Sir Michael l'Corren and herself in attendance. 1866, Novembre 7th: Antonia is knighted in the Royal Chapel of Aveyron Palace by King Jean-Paul l'Valdan, with only the closest family in attendance; afterwards Queen Louisa l'Valdan grants her the membership in her court faction of the Falcons. 1866, Decembre 12th: Antonia takes part in the Tourney Duels of the Wedding Tournament held at Sunsreach, going unbested through her first pairings till she is defeated by her own brother Sir Elrick t'Tremaine in the finale, thus making second place in that particular contest. 1867, Marse 4th-12th: Antonia takes part in the Circuit Tournament in Venderos, making a particular good showing at the Tourney Duels, and riding in the joust preliminaries and the jousting main event. King Jean-Paul l'Valdan : I am sure you will prove to be a worthy king. You have my full loyalty. Queen Louisa l'Valdan : It was in fact your example that encouraged me to continue with my sword training, after Etienne was old enough to allow for some time of leisure. We have sparred occasionally and I am grateful for the things I have learned from you during those sessions. Both in regards to swordplay and adapting to my role as a prince's wife. You have my support. Even moreso, since you put in a word for me to get finally knighted, and accepted me into your circle of Falcons! Late King Maris Ulbrecht l'Valdan (deceased) : My father-in-law, I was glad for the opportunity you gave me, to fight at your side against the Raiders of Brodlund, still I dread it was on the day you passed away from us. Dowager Queen Cynthia l'Valdan : My mother-in-law, you have welcomed me to the family when I married Silvio; you are kind towards Etienne, still I feel there is the unspoken question lingering between us - that slight hint of a rebuke - why Etienne has no siblings so far. I wish I could give you an answer for that, and by the One, I am hoping that I will one day have once again good news for you. Prince Silvio l'Valdan : My husband. You certainly grew on me, after my betrothal to you somehow crossed my plans to become a knight. You are a great father to Etienne. I only wish the One would bless us with more children. Lord Etienne l'Valdan : My dear son. I adore you, a true gift of the One. You have all opportunities, and shall have the best training, and a worthy knight to squire for. Princess Aliza l'Valdan : Sister-in-law, with a sense of diplomacy I lack. I admire your intelligence, and I am so glad you were spared from that match to that Southerner Viscount. 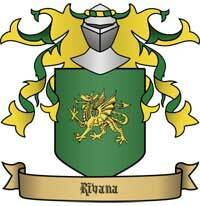 I believe we share a slight wariness and distrust for the people of Rivana. Sisters-in-law and mind. Princess Emmaline l'Valdan : tbd. 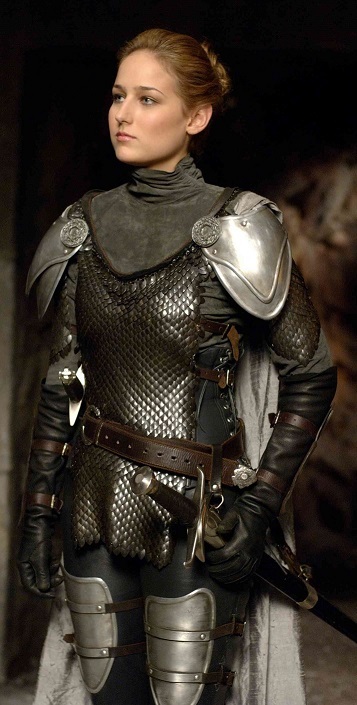 Lady Ariane Greycen, née l'Valdan : Sweet sister-in-law, I do not envy you. To be used as a pawn in this political game, and be married off to a Southerner! Sir Lillian l'Valdan : Distant cousin to the King, and little sister to High Cavalier and fellow Falcon Sir Andrea. The round when I faced her in the tourney duels proved to be the most taxing, apart from the finale against my brother. It took all of my persistence, and she almost got me defeated. I recognize good swordmanship when I see it, and such I observed in this very capable knight. Lord Sir Elrick t'Tremaine : My brother, the heir. There was a time when I envied you and cursed my fate, to be born a daughter and married to a prince, with the purpose to become a mother of more princes and princesses. You at least were allowed to follow through with your path, and I am proud of what you have achieved so far. My duties as a princess have brought a distance between us, still, you will always be my dear little brother. One above, the two matches where we faced off against each other in the tourney duels at Sunsreach! Me besting you first, then you fighting your way back right into the finale. You deserve the win of that contest, I am so proud of you! Lady Amara t'Tremaine : My little sister, too good for the world. I do understand why father sees her as a disappointment, given her rather odd views. But she has a good heart and is fond of Etienne. We may not see eye to eye with another on a number of topics, but… she's my sister and I love her with all my heart. If only I could protect her against the cruel true face of the Edge. Lord Sir Michael l'Corren : I've seen you fight in the battle against the Brodlund Raiders, and I can only admire your courage and prowess. They say certain experiences shared can forge a bond between people. On our case, it were those hours at the Cathedral of Rovilon we spent beside King Maris as he awaited his death. You have my fullest respect and support. And my thanks. After all it was you who arranged the spar with Queen Louisa, which earned me her support and in the end, my knighting! Lord Sir Samuel l'Corren : I defeated him in my round against him in the joust preliminaries, by points. Apart from that I know little of him. Sir Evelyn : A courteous but also very persistent fighter, I had the honor to face during the tourney duels at Sunsreach. I defeated her in that round, but would have almost faced her again in the finale, had my brother not managed to defeat her in the match preceding it. Also… this is the knight I managed to unhorse in the joust preliminaries at Sunsreach. Even so, I share her view that knightly games may have less significance than true battles that are fought to serve the realm. Lord Sir Justin t'Acuto : A very corteous man, who seems rather considerate in picking his words. He sought me out in Sunsreach to offer his congratulations on my performance in the duels, was all politeness. Then talk turned towards matches and I am not sure I read his intention correctly, so I had to call him out on his relation to my sister Amara. Which, he assured me then, is merely a friendship, with him not entertaining any intentions towards her. Just what are his intentions? 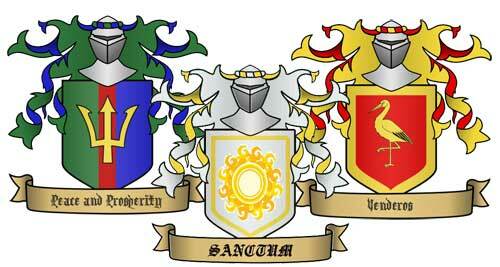 Lord Sir Jonathan t'Maren : Winner of the Tourney Duels at Venderos; tbd. Lady Sir Alexandra t'Artan : She unhorsed me in the first round of the bracketed joust at Venderos! Now I'll need to ransom Othello back from her. Queen Alysande of Rivana : As the sovereign of our former enemy, she deserves my courtesy; even I have understood that times are changing, still, old grudges are so hard to give up on. 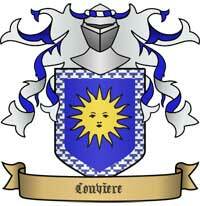 Sir Devlin Cassomir : Brother to King Jaren, and a knight of Rivana who keeps besting me in jousts *rolls eyes*. I remember a loss by points in both the preliminaries at Sunsreach and Venderos. And now, during my first showing at a bracketed joust, he shattered his lance against me. I bet he didn't think I would manage to stay ahorse after that. Sir Thaddeus Greycen : He is married to my sister-in-law Ariane, in a first cross-kingdom-match. I bested him at the Venderos Tourney Duels. A capable knight. Thaddeus' squire Gawain Rosendal : My first opponent in the duels at the Venderos Tourney that managed to best me, to my surprise. My fault for underestimating him, perhaps. A mistake I shall not commit twice. Duke Darren Haldis : He does strike a hard mace; kicked me out of the contest of the tourney duels at Venderos, after besting Elrick already. I would have liked to defeat him, alas, it was not meant to be.